Posted on Wed, Nov 23, 2011 : 4:06 a.m. The new dinnerFeed site has just been launched! Click here for a collection of well-tested Thanksgiving recipes. A "Print-Recipe Only" function and speedy search engines make finding recipes a cinch! I thought I'd hit every base when it came to recipes for Thanksgiving. Apparently not. My son asked to make sure I included some version of sautÃ©ed greens, so I came up with this. I filled my Dutch oven to capacity with the greens, which quickly cook down. It always surprises me how such a big bunch of greens can yield just a small amount of cooked vegetables; I purchased two large bunches of chard, which only yielded 6 cups of finished greens. The walnuts beef up the portion size and bacon adds a festive flavor wallop to the greens —a fine Thanksgiving warmup dinner for two. 1. Fry bacon in a Dutch oven or large, heavy-bottomed pan over medium heat, until crispy. Transfer to a plate lined with paper towels; discard all but 2-3 tablespoons bacon fat. 2. Add shallots, chard stems and thyme to the pan drippings and cook over medium-high heat, stirring, until the shallots begin to brown, 6-8 minutes. 3. 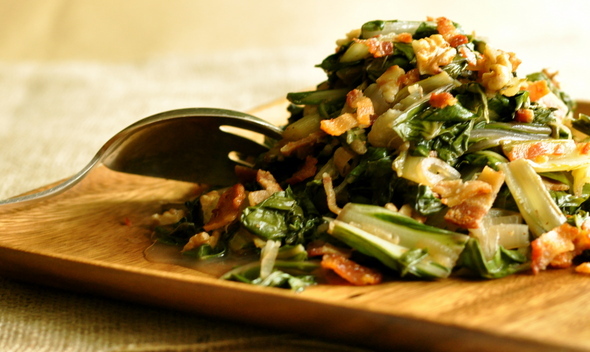 Add chard leaves, water and lemon juice and cook, stirring, until wilted, about 2 minutes. (Note: I used a Dutch oven, and initially the pot was packed. If you don't have a large pan, you may want to use two pans.) Cover and cook until tender, 2 to 4 minutes more. Remove from the heat; stir in the bacon, walnuts and season to taste with freshly ground pepper and kosher salt, if desired.